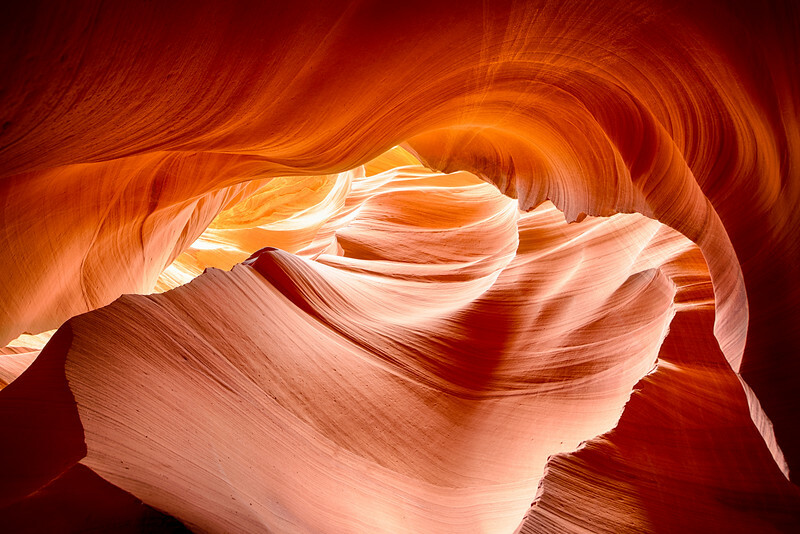 The numerous slot canyons around Page, Arizona, present wonderful photographic experiences. I’m amazed many of these slot canyons have even been found, since from above they look like no more than a narrow crack in the ground, and there is so much land to explore to find the entrance. No wonder most are found by accident. The most famous are Upper and Lower Antelope Canyon, and I had the chance to photograph in both. This image comes from Lower Antelope, which was the last place I shot before heading on in my travels, but it was also—I think—the best canyon to photograph. The colors, lines, height, and size of Lower Antelope made it my favorite. It also didn’t hurt that there were few people in the canyon, which made it easier to photograph. It was almost hard to take a bad picture during my two hours in Lower Antelope, but some images stand above the rest. Over thousands of years, rushing water has formed these canyons. As I walked through these incredible geological formations, it was almost too difficult to imagine how much water had to have been required, and the speed of the moving water, to forge these canyons. However long, and however much water it took, the results are amazing. The lines are both smooth and sharp; the light filters in from above casting beautiful soft hues of yellow, red, and orange; and the shape of the canyon walls create a wonderful contrast of highlights and deep shadows. Each image from this place is unique in its own way. That makes it hard to choose just one (or a handful) that stand above the rest. But, so far, this image is one of my favorite. Hope you enjoy it, too.